Roadside Retail: An international symbol of access? An international symbol of access? The international symbol of access (ISA) is often seen where access has been improved, particularly for wheelchair users. But in this instance the ubiquitous symbol appears to negate its original intention. Spotted at a gate's entrance in Sochi, the text on the small notice beneath explains: "Keys from this gate are held by a railway station duty manager and in the medical (first aid) office." Minale Tattersfield's view is that disabled access shouldn't be an afterthought, something tacked on without conscious planning. Rather it should regarded as an integral component of a designed environment that takes into consideration the common needs of all user groups. Let's not forget that we can all find ourselves 'disabled' in certain stress-inducing situations, for example when we are in a hurry, carrying shopping, the children are distracting us...severe weather conditions...and so on. 2014 will be the first time Russia has hosted the Paralympics. 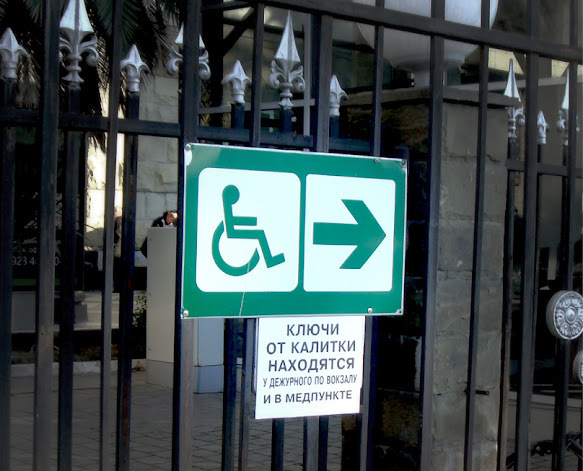 Consequently there is an unprecedented opportunity for host city Sochi, and indeed Russia, to leave a positive impression of its treatment of disabled visitors. There is still plenty of time left ahead of the Games to minimise potentialities for negative experiences and to deliver a more holistic approach to wayfinding accessibility.